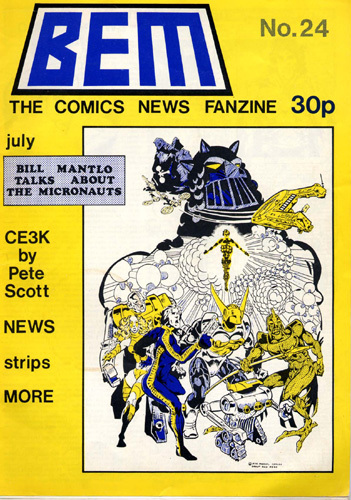 BEM: Bill, I suppose the logical first question to ask is how you came to be involved in comics in the first place. Were you an active comics fan? Bill Mantlo: Well, I'm 27 now and I've been reading comic since I was 7 or 8. When I started, back in the 50's, comics were 10 cents. My weekly allowance was 25 cents-this of course was before inflation and before they took the silver out of quarters-and with that I would hop on my bike and ride to the local candy store where I'd buy 2 comics and a pack of baseball cards (or monster, football, Davy Crockett cards, etc). Now you're lucky if you can get the cards for a quarter. Anyway, the comics I bought then were the usual DC ones- Superman, and their square jawed Batman. I thought they were wonderful and still do. Others were books like House of Mystery, Strange Adventures- I remember a lot of those short horror or sci-fi stories as being brilliantly told, simply told. Marvels, at that time still called Atlas, with their monster books somehow never caught my eye. Then in the early 60's, there was this sudden explosion. I'd walk into a candy store and, along side Batman, there were title like Flash, the Justice League, Green Lantern, and Showcase, introducing more heroes in a year than I'd seen in a previous decade. It was tremendously exciting, a whole new approach. And I'd follow the adventures of these DC heroes religiously, adding Metal Men, Sea Devils, Blackhawk, Hawkman, The Atom, etc, to my reading list -obviously my allowance had been raised. But even this DC explosion was as nothing the day I walked into that same candy store and there, on the stand where they usually stocked batman, was a copy of Spider-Man #4. It looked…different. I skimmed through it, not quite knowing what to make of it, and put it back on the shelf. Then I took it down again, began to get caught up in this weird webbed character trying to hold onto this sandy villain who seemed to spill through his fingers and, well, I don't think I missed a single issue of Spider-Man from then onto the mid-or late-60's, when Ditko left. I was in junior high then, a real rough school where you had to compensate for your inability to fight by possessing a talent. Mine was drawing. I spent so much time tracing Marvel Comics that I began to develop a crude style. With friends-including the bullies who wanted to kill me to begging to be put in the books as villains-I began producing my own colored pencil and crayon comics called, I believe, Congo Comics. They featured such memorable characters such as the Bulk and the Revengers. Real original. I should add a parenthetical comment that all this took lace in JHS 192 in Queens NY, a real dead end as far as neighborhoods and public education went. It could have all ended there, I mean like I could have gone on to Andrew Jackson High School a few blocks away and into wallpaper design, except that there was one art school teacher who ignored her better judgment and insisted I take the test for NY' High School of Art & Design, in Manhattan. I think I'd been to Manhattan twice in my life-people in the boroughs of NY speak of Manhattan as "The City"- bit I was determined not to go to Andrew Jackson, so I packed my ludicrous portfolio of tracings and Congo comics, got on the subway, and went to A&D. Miraculously, I passed the test, and spent the next four years ignoring my teachers, who declared that comics were crap, and continued drawing them. Yes, drawing. I wrote a lot of prose and such, and wrote the primitive comics I drew, but my primary interest was becoming the next Gil Kane. This continued until I entered the Cooper Union School of Art, a real prestigious art college in Manhattan. There I dropped comics like a stone, began painting and went into photography. I spent the next four years taking pictures, and there I met another photographer, Karen Pocock, who was to become my wife. We both graduated, and immediately found out that photographers were a dime a dozen. I was unemployed, took some lousy civil service jobs, and then an old college friend, Annette Kawecki, called. Seems she had gotten a job as a letterer at Marvel Comics, and wondered if I'd be interested in doing past-ups and mechanicals for them. I hadn't thought about Marvel Comics in years, literally, I had stopped buying them after I graduated high school, but a job was a job. I was interviewed by the late John Verpoorten, hired, and became his assistant, doing the most mindless production work there is. But was I an active comic fan? Well, as I've said, I bought and read the mags all through high school, eventually dropping DC in the mid-60's, and Marvel as I grew older and they, I felt, entered a rut in the late 60's, early 70's. I went to high school with Frank Brunner, and we'd go to a few comic conventions, but I don't think I ever belonged to any organized "fan" movement, and I never saw, let alone read, and fanzines. But there was a group of artists-readers at Art & Design, and we all competed with each other to draw and, peripherally, write the stuff. BEM: Of course, when you did start to do scripting, you weren't given a top Marvel series right away. What was your earliest work, your earliest regular feature? Bill: As I worked, I'd watch artists and writers wandering in, arguing, talking about their work. I'd given up all desire to draw comics, and I found out most- not all- of the writing at this time (about 1972) to be really childish, especially the then black & white horror and Kung-Fu books. I also noticed that all the writers had incredible difficulty meeting their deadlines. I couldn't see why, the work didn't look that difficult-especially given some of the stories they were producing. So one day Tony Isabella, a Marvel writer and then editor of the black & white line, rushed into Verpoorten's office in a panic and cried that he needed someone to script a Son's of the Tiger story for Deadly Hands of Kung-Fu overnight. He'd plotted the job, which was drawn by then novice artist George Perez, but was caught in a deadline crunch and couldn't script it. John Verpoorten, who delighted in torturing poor Tony, said he didn't have anyone who could turn in the job by the next day without screwing up their own schedules. Tony, he said, would have to do it himself. It was then that I heard myself say almost involuntarily, " Tony, I'll do it." Tony looked at me incredulously. I mean, I was a paste-up man who'd just recently began coloring Marvel books. But Tony had the decency not to laugh, and he gave me the job. I scripted it overnight, turned it in the next day, and with very few editorial changes, it was accepted. The rest is history. Since then, my speed and reliability got me the reputation as Marvel's "fill-in king". I would write any character quickly and, while my plotting was weak, everyone liked my dialogue. I seemed to have a flair for catching the Marvel hero's syntax. But as editor after editor came and went (Roy Thomas to Len Wein, Len to Marv Wolfman, Marv to Gerry Conway, Gerry to Archie Goodwin, Archie to Jim shooter) I seemed to get passed over for a regular title. I'd done a run on Marvel Team-Up, but that's one of those books that sells very well, but which writers hate. You can't really develop the characters because they all star elsewhere. I was given other titles (Frankenstein, Morbius) but they were mags that were near cancellation anyway, and failed even before I could get started. 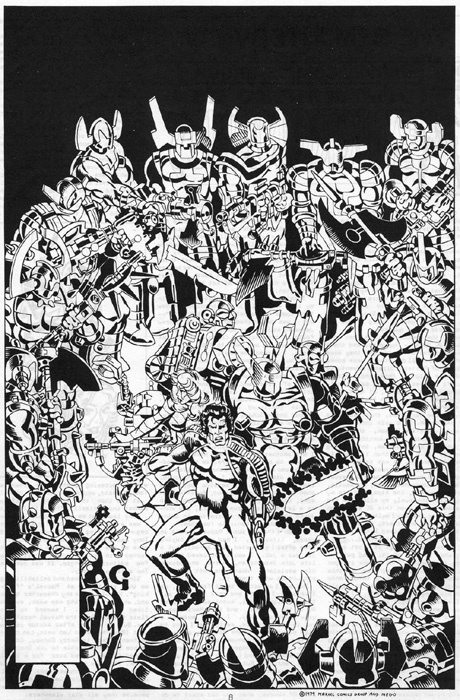 Only my work on Sons of the Tiger had any sense of continuity, and there was an unfortunate and unfair to ignore the then-weak black & white department, and George Perez and I worked in virtual limbo, doing as we wished with our semi-kung-fu characters, creating new characters like the White Tiger. Then someone noticed that George had gotten really good and offered him Fantastic Four or Avengers, I forget which. So George left, and we began playing musical artists on Sons of the Tiger. Keith Giffen, a favorite artist of mine, came in for an issue or two, and we created Jack of Hearts (my idea, Keith's visualization) -but the Kung-Fu mag dies shortly after, and I was put on Ironman and Peter Parker, the Spectacular Spider-Man. I also did fill-ins and mags like Skull the Slayer, but it was on Ironman, my first regular feature with a character whose destiny I could control, that I really began to learn how to plot. Peter Parker was plotted by Archie Goodwin for a time, so all I did was add dialogue and captions, but Ironman was mine. I tried to take a sagging character out of Marvel limbo and build him back up to greatness. Again, I was hampered by lack of editorial interest and George Tuska's extremely pedestrian art, but I think I began to achieve a measure of what I wanted-to invest Ironman/Tony Stark with some semblance of humanity, -before I was taken off the book. The reader reaction was incredibly, overwhelmingly positive, for both Shellhead and Jack of Hearts, who I brought into the mag, but Jim Shooter became editor about that time and. Like anywhere else, an editor has his own ideas about how things should be. So Jim removed me from Ironman, but did so in the most professional manner I'd ever seen at Marvel- instead of just taking away and leaving his writers flat, he gave us the chance to create new titles, new characters, or to show what we could do on other Marvel series he thought we might be better suited to. I had already proven that I could script Spider-Man, so now I was allowed to plot Peter Parker as well. Then followed the Micronauts; I was given Tarzan and, when Steve Gerber left Marvel, I was the first writer Jim asked to take over Howard the Duck! Jim, it seemed, had this idea (based, I guessed, on my offbeat work on Skull, Man From Atlantis and the Human Fly) that I write best those characters outside the Marvel mainstream. I question that, but Howard certainly fits into Jim's theory. BEM: It's often said that you've scripted more Marvel characters than Stan Lee, counting all the fill-in issues for various issues you've done. Is it easy, to write a fill-in issue for a long running title? Is it a fair way to judge how good a new write is? Bill: Fill-ins are a terrible way to judge a newcomer's work. At the time I started, writing fill-ins meant producing a mag overnight, or on your lunch hour (remember, I was still working as a production assistant at the Marvel bullpen; unlike now where, as a freelancer, I work out of my home) and quality was secondary to speed. The writer was put into a lousy position-on one hand you had the artist screaming that he needed work immediately (and if it was Sal or John Buscema you didn't dare not send him something) and, on the other hand, you had an editor that either didn't have the time to oversee your work, or the inclination. This did vary, of course, form editor to editor- some not having the time, others not caring. So you'd quickly draw on your remembrance of a character you'd never written before (I was lucky, I guess, in having a very vivid memory of everything Stan Lee wrote, having read Marvel when Stan Lee wrote just about everything) and bang out a plot, or phone it to the artist. Then, when it came back, and the same editor who hadn't bothered to read over your plot before he saw the script, they'd blow their corks and scream, "This isn't what we wanted!" forgetting that they'd never given any indication of what it was they did want. My saving grace again was syntax-I could make Thor sound like Thor, Spider-Man sound like Spider-Man, and had all the sub characters reasonably straight. Another factor was that Marvel always missed deadlines at the engraver or the printer, and many books were passed through editorial as if along an assembly line, hence all those typos, uncorrected coloring, and plot faux pas. BEM: Which characters did you find the easiest to write fill-ins for, and which were the most difficult? Bill: I've always found Spider-Man the easiest Marvel character to script. Plotting is different because, never having written the main Spider-Man book- Amazing Spider-Man- I was never able to control or direct the fate of the character totally. The Fantastic Four and Thor I find extremely enjoyable. Daredevil writes easily, but I've never had to deal with any of his sub-plots. Ironman is tricky, but enjoyable. Killraven and the Defenders were dreadful, either because the writers at the time I did the fill-ins were in the middle of incredibly convoluted story lines or because they themselves seemed unable to focus on their characters. With those two I was also in the unbelievable position of scripting "cult comics"-mags that had picked up a rabid following and for whom it was sacrilege to have an issue written by someone else. The X-Men was another such title but, at the time my fill-in was scripted, only the very first appearance of the new X-Men had premiered, and none of Chris Claremont's subsequent character development had been initiated. When mine did run, readers asked where all that characterization went. Had I been able to respond at the time, I would have said, "Hey! There weren't none when I wrote my issue!"